Keeping Food Safe — York Electric Cooperative, Inc. 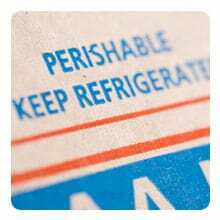 Always keep meat, poultry, fish, and eggs refrigerated at or below 40 ºF and frozen food at or below 0 ºF. This may be difficult when the power is out. Keep the refrigerator and freezer doors closed as much as possible to maintain the cold temperature. The refrigerator will keep food safely cold for about 4 hours if it is unopened. A full freezer will hold the temperature for approximately 48 hours (24 hours if it is half full) if the door remains closed. Obtain dry or block ice to keep your refrigerator as cold as possible if the power is going to be out for a prolonged period of time. Fifty pounds of dry ice should hold an 18-cubic foot full freezer for 2 days. Plan ahead and know where dry ice and block ice can be purchased.